I found this amazing cutout ankle boots on E-bay rounding 30€! They look a like of the model of Jeffrey Campbell but they are so much cheaper, maybe I'm gonna buy them before the end of the month. They are beautiful and the cutout trend is completely on right now! 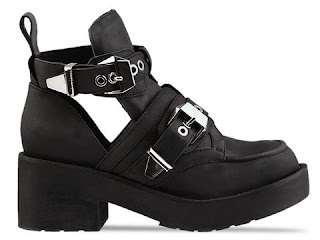 Encontrei esta magnificas ankle boots no e-bay por mais ou menos 30€! São super parecidas com o modelo do Jeffrey Campbell mas MUITO mais baratas, acho que as vou comprar antes do fim do mês. São tão giras e estão super na moda agora!